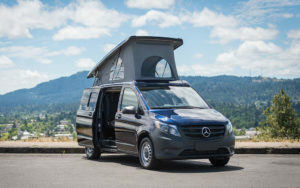 We can customize your van to fit your style and make it perfect for you, whether it's camping, tailgating, hiking or leisure travel. You don't need to have your own vehicle to convert to a camper van. Check out the vans we have for sale! Keystone Coachworks currently offers our Metris van to rent. Take it sightseeing without the hassle of parking a large vehicle. We can customize your van to fit your style and make it perfect for you. 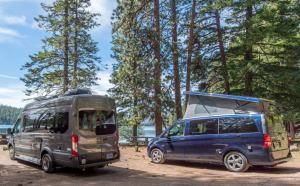 Whether you want to take on the road and travel across the country or turn it into the ideal camping vehicle, we pay attention to detail and quality to make it last. We're the only luxury van with a shower and cabinets all surfaced with Corian and floors made of Dekton. Designed for long lasting comfort and luxury. You can choose from any color of Corian surfaces to personalize your van. 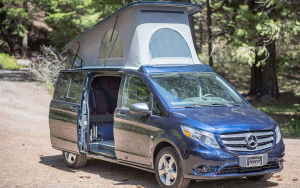 With a pop top conversion this van will comfortably sleep four and seat five people. Perfect for a couples or family vacation in style. Welcome to Keystone Coachworks, the home of the luxury coach van built to last with high quality craftsmanship. These are individually designed for comfort with class. We are the only luxury vans and coaches made with Corian surfaced cabinets and shower on all sides, not just the top, making it extremely durable and scratch resistant. The floor is made of a new product called Dekton and is guaranteed not to scratch or stain forever. Designed with long-lasting luxury, comfort, and beauty in mind. We can upfit a Ford Transit with Corian surfaced cabinets and shower on all sides, not just the top, making it extremely durable, scratch resistant, and beautiful. Select from any Corian color to personalize it just right for your needs. Your Ford Transit also features Dekton floors and is the highest standard in luxury vans. What did you have a question about?